© 2013 Secret Stash Records (uploaded with permission) While Secret Stash has been in the business for several years releasing a number of gems ranging from the soul of America to reggae takes on Miles Davis and acoustic Peruvian folk music, they are now focusing some effort on new music as well. Longtime Secret Stash fans rest easy, though. They are still going to continue to mine the vaults the world over to find long-forgotten but essential music. One of their first new music releases is coming out this September courtesy of Black Market Brass. The band and label both hail from Minneapolis. Secret Stash, which has a very DIY approach to their label, often hosts record-release assembly parties where the local community is invited to come to their offices and assemble the records and album sleeves in return for pizza and beer. It was through several of these that Eric Foss, VP of Marketing and Sales for Secret Stash, met Mitch Sigurdson, one of the founding members of the band. Sigurdson assembled some friends and local talent to play a variety of styles, often Ghanian highlife and funk. Per Foss, “I think it took a little while for them to realize that they play Afrobeat as well or better than most of the bands out there doing it today. I watched as they transitioned from playing spot-on covers of Fela and Tony Allen to writing their own material.” This past April, the band headed to the studio to record some original material. Coincidentally, the band picked up a new baritone sax player, Cole Pulice, who was already working with Sonny Knight & the Lakers and Dérobé Dance Band, bands whose original material also will be seeing releases from the label. In a single afternoon, they cut the two tracks heard on the upcoming 45. “Snake Oil Man” is heavy Nigerian madness. You can bet that it’s no beginners luck. 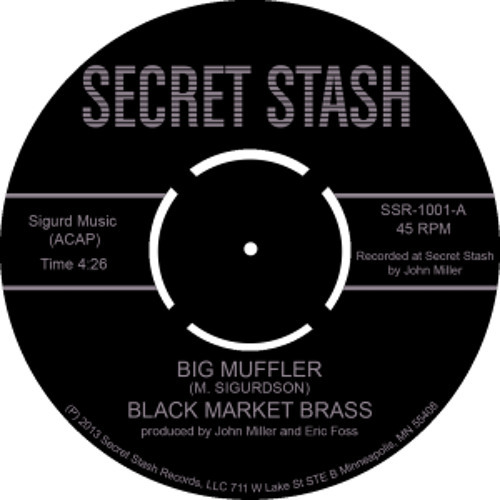 Check out the flip side, “Big Muffler," on Secret Stash’s SoundCloud page (https://soundcloud.com/secretstashrecords/black-market-brass-big-muffler). If this is their first swing at the genre, you can expect some exciting material in the future from Black Market Brass who has enough original material already for a full LP. We reached out to Pierre Chrétien from Souljazz Orchestra, who knows his way around an Afrobeat tune, to hear his thoughts on the band’s sound. Says Chrétien, “It sounds amazing. Definitely no lack of sweat and stink here!” No disagreements here. I'd have paid for this! Download Black Market Brass "Snake Oil Man"
Users who like Black Market Brass "Snake Oil Man"
Users who reposted Black Market Brass "Snake Oil Man"
Playlists containing Black Market Brass "Snake Oil Man"
More tracks like Black Market Brass "Snake Oil Man"